For a grand total of maybe $7, I'll take it. 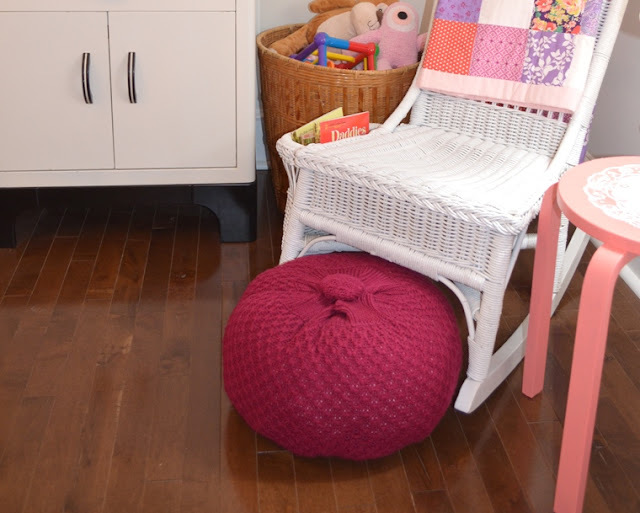 It makes for a nice footstool in front of the rocking chair in Johnnie's room. Here was the plan: Go to Goodwill. Browse around for a couple discarded plum or, preferably, coral-hued sweaters (so I could make more than one if the first was a bust). Preferably in size XXXXXL so it would be big. Look for stripes or designs that are too ugly to wear, since that might actually work perfectly. (Our Goodwill here is a haven for the most generally unwearable clothes -- piece of cake.) Bring it home, wash it, cut it, stuff it, sew it and see what happens. Here's what actually happened: I went to Goodwill. Johnnie took one whiff of the funky stale coffin smell and started crying as soon as we got inside. I whisked her back to the sweater section. She sneezed. I grabbed the first sweater that was remotely somewhat related to the color family that I was looking for. (It's neither purple nor orange... I guess you'd call it cranberry aka "good enough.") I dashed to the register and paid my $3, apologizing about my fussy baby to the girl behind the counter, who couldn't have been older than 17 or over 100 lbs. but said that her three-year-old always fusses when they shop. My mind was blown and my heart felt heavy. We had to get out of there. Then I went home, and the sweater sat around for like two weeks until I located a needle, some heavy quilting thread and a pile of clothes bound for the donation bin. (And since I only had time to grab one sweater, I needed time to build up courage because I figured this was an all-or-nothing scenario since Goodwill + Johnnie = incompatible.) Finally I got my act together, put the baby down for a nap and got to work. 1. Prepare the sweater. I chopped off the sweater's sleeves and cut straight across the top, lopping off the neck and shoulder seams so that it was sort of a big cylinder. 3. 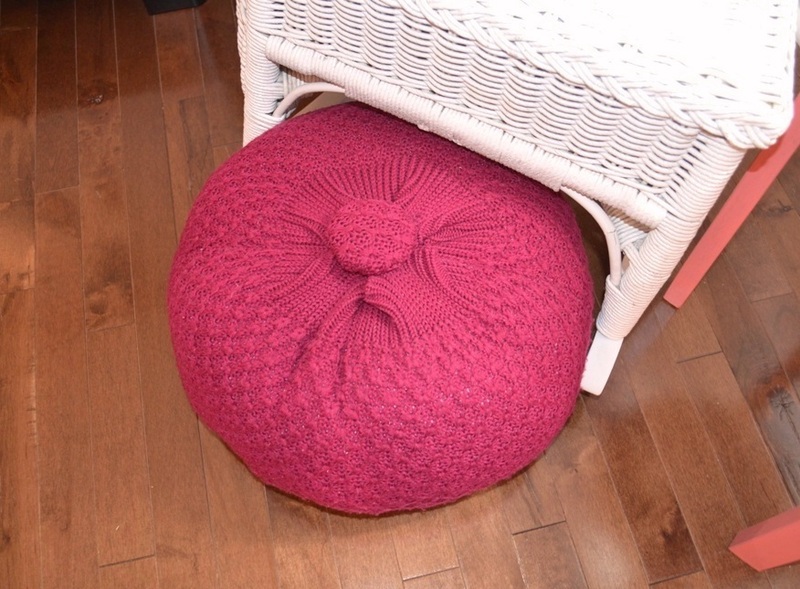 Stuff your pouf. I used 2 old pairs of jeans (since they're heavier) on the very bottom. (Size 1, which I will almost certainly never fit into again.) Then I used a regular old IKEA down throw pillow insert that I had lying around. Then I rolled up some some t-shirts and tucked them around the edges to make sure the pouf would stay round and be firmer around the edges. You could probably do a more careful job than I did at making sure there are no lumps. Then I firmly tucked a fluffy fleece baby blanket down around the whole pile to sort of "unite" everything and keep it from shifting too much. 4. Close your pouf. I closed it by sewing opposite sides of the opening together, very evenly. The bottom of the sweater had a nice finished hem, so that's how that little detail at the top was achieved. Then I let it sit around untouched for another two weeks (procrastination is the key to success) before I finally bought a button from Amazon because it nicely completed my Super Saver Shipping order. 5. Make and attach your button. I used a 2.5" half ball cover button and two circles cut from the sweater's sleeve (to make a double layer of fabric so you couldn't see the metal button through the sweater's holes) to make mine. I must warn you though, sweaters are too thick for the button to work properly. (I improvised in the most hillbilly fashion. It involved the broken-off prong of a plastic fork...) You could just as easily use the lid from a jar or anything else that's round, sturdy and the proper size to cover the ugliness of where everything meets in the center. Sew the button to the top. Also it's funny how your perceptions and preferences can change when you have a baby... I wasn't going to go all girly in Johnnie's room. Now look at these colors! All that sugar and spice hurts my eyes, but I can't stop myself. What do you think? Should I quit my day job and just make poufs all day? Anyone else making anything out of their tiny old jeans? Can you believe I have a daughter named Johnnie whose belongings are all pink? I love it. My mom knit us one (she has yet to stuff it) but I am psyched after seeing how amazing yours is! that looks great! plus i don't blame johnnie for being fussy in Goodwill. I get fussy and sneezy in GW. Meghan - there were beautiful hand-knit ones on Etsy that I loved but could not justify buying... which is what led me to this. Not nearly as awesome as the handmade one your mom is making, no doubt, but an acceptable alternative. Nice Pouf, but I spent more time looking at your nice floor. 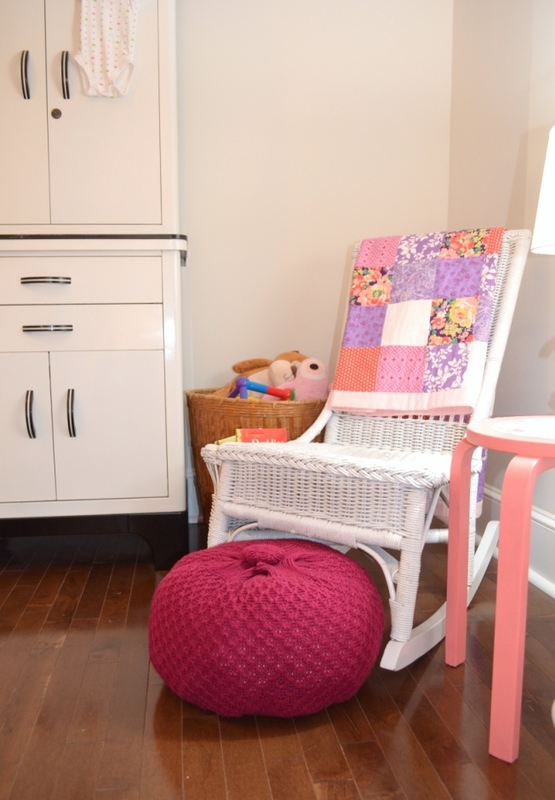 Also, have you blogged about the kitchen type cabinet in Baby's room? Did I miss something? It looks like a metal cabinet to me. Am I wrong? Thanks Mel re: the floor. Those narrow planks were a pain to install!